The Inifinti line-up is set to get more attractive in 2010 with the addition of a much-needed diesel engine. Until now, the range has been powered by either a 3.7-litre V6 or 5.0-litre V8. The bespoke new 3.0-litre V6 uses direct injection technology to achieve 550Nm of torque - a figure that Infiniti claims makes it class leading. Phase two of Infiniti's quiet assault on the European luxury car market is underway with the arrival of a newly developed 3.0-litre V6 diesel. The engine, the first in the brand's 20 year history, has been specifically designed to deliver high levels of refined performance in line with Infiniti philosophy. 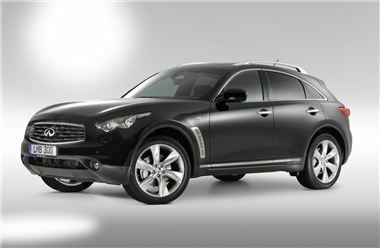 It will initially be available in both the acclaimed EX and FX crossovers and later in the Infiniti M luxury performance sedan. The new diesel is a key element to Infiniti's continued growth in Europe. Launched barely a year ago, the Infiniti range has won high praise from customers and the motoring press alike. Now with five established model lines - G37 saloon, coupé and convertible, plus the EX and FX ranges - more than 2000 Infinitis have been sold across 15 markets despite the marque's launch coinciding with the worst global recession for decades. "The sales success enjoyed by Infiniti in Europe against a backdrop of financial uncertainty proves the cars' appeal to a discerning audience. We have established Infiniti as the luxury performance brand thanks in part to the remarkable multi-award winning VQ petrol engine that powers most of the models in the range," said Jim Wright, Vice President, Infiniti Europe. "We were aware from the outset, however, that for Infiniti to offer a complete range a powerful diesel engine was a must, especially in the European premium SUV market where diesel represents the bulk of sector sales. "Although we did investigate the possibility of adapting an existing large capacity diesel for Infiniti, we quickly established that nothing on the market met our exacting requirements. We needed an engine that delivered not just stunning performance but exemplary refinement too. For that reason, with the Alliance we decided to develop our own engine, a performance diesel worthy of the Infiniti badge," said Wright. Designated V9X, Infiniti's new V6 diesel has been developed in Europe by Infiniti engineers working with other engineers from Renault and Nissan. It is made at a state-of-the-art facility in Cleon in France, some 100 kms west of Paris. From the very start of development, the new unit was created to answer Infiniti's demands for a powerful but exceptionally refined diesel engine, quiet enough in use to match the high standards set by the petrol engine. With Infiniti's specific requirement for a compact unit delivering high levels of power and torque with competitive emissions, strong economy and unrivalled refinement leading the development, work on the direct injection 2993cc V6 began in 2005. At the same time, the engine bay architecture of the EX and FX models - designed initially as petrol models only - called for a compact engine which, if it were to be used in both transverse and longitudinal positions, would need to have a comparatively narrow vee angle as close to 60 degrees as possible. Conventional cast iron, however, would place too much weight over the front wheels and lower the levels of driving pleasure offered by all Infiniti vehicles. In its place, the engineers chose Compacted Graphite Iron (CGI), a material that offers all the benefits of cast iron and more - it has higher levels of stiffness and noise absorption - but without the weight penalty. And while CGI is heavier than a pure aluminium block there is no need to add stiffening ribs or extra sound deadening material so the weight gain is comparatively modest. CGI was patented in 1949 and its first commercial application was for the brakes of Europe's high-speed trains. It is 75 per cent stronger and up to 75 per cent stiffer than grey iron, the most common form of cast iron found in engine cylinder blocks. It also performs better than aluminium at higher temperatures when it is up to five times more fatigue resistant. Best of all, the weight of a typical engine block can be more than 20 per cent lower than an equivalent cast iron block. The result is a compact, architecturally stiff and refined unit that by itself delivers two of Infiniti's design goals: high levels of refinement and no loss of chassis balance. In tests, Alliance engineers have determined that the V9X engine has the lowest 250 Hz and 500 Hz vibrations of all the benchmarked engines. To ensure it fitted under the bonnet of both the EX and FX models, there are a number of significant differences between the Infiniti engine and its ancillaries and the version used in front-wheel drive applications. A number of changes also had to be made to the engine bays of the EX and FX. 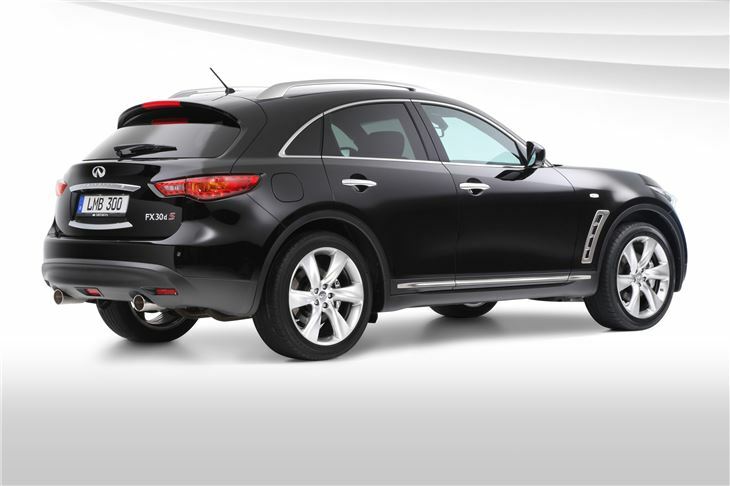 As used in Infiniti models, the engine has a different cylinder block, a new design of crankshaft as well as new or revised intake manifold, fuel injection system, exhaust gas recirculation, turbocharger, oil sump and manifold catalyst. It is tuned differently, too, for more responsive performance and is ‘dressed' differently, in keeping with the visual identity and design expression of the Infiniti brand. Differences between petrol and diesel versions of the EX and FX models are equally far reaching and include a new front subframe, different front bumper designs to enhance air flow into the engine bay as well as redesigned sheet metal within the engine bay to house additional radiators needed for cooling. The next phase of the engine's development was to achieve the high levels of performance demanded by Infiniti owners. The result is a clean sheet design that takes current direct injection technology to a new level. Combustion chamber design has been optimised to improve the balance between emission levels and fuel efficiency and the compression ratio has been lowered to 16:1 to benefit not just economy and emissions but also noise, vibration and harshness (NVH). The depth of the cone-shaped valve pockets have been reduced and a mini-sac seven-hole injector nozzle adopted while the bowl diameter has been widened and the spray angle adapted accordingly for a better swirl effect at the same time as reducing thermal losses. Internal engine friction is reduced by the use of ultra smooth components such as the micro-finished forged steel used for the crankshaft. Class leading levels of torque and highly competitive specific power outputs are delivered thanks to the adoption of a comparatively large single turbocharger, which is mounted within the vee of the engine, an intercooler and the use of the latest generation of Bosch common-rail fuel injection. This system incorporates piezo injectors and operates at 1800 bar. Power output is bang on target at 175 kW (238 PS) while the class-leading torque output of 550 Nm (for rear and four-wheel drive applications) is better than the target. Better still, peak torque is achieved from as low as 1,750 rpm and is available all the way to 2,500 rpm, while as much as 500 Nm is available from a mere 1,500 rpm. Idle speed is an exceptionally low 650 rpm with none of the NVH usually associated with a diesel. The result is strong low-end performance with comfortably refined delivery. Throttle response is exemplary and although noise is kept to a minimum, special tuning of the exhaust note provides a pleasantly sporting note at about 2,500 rpm under hard acceleration. Engine refinement is complemented by Infiniti's smooth seven-speed automatic transmission, standard on both EX and FX, which has been tuned to take full advantage of the high levels of torque. "Whether at idle or at 2,000rpm such is the refinement of the new diesel engine that the only way a driver will know what's under the bonnet is by looking at the rev counter and seeing where the red line falls," said Wright. With performance meeting or exceeding the design goals, the final stage of engine development was to ensure the V6 met or exceeded emissions and fuel efficiency targets, including achieving Euro 5 compliance. In addition to the advances made by the changes to the combustion chamber, the V9X engine also incorporates a number of innovative features designed both to enhance emissions performance and improve reliability. Among these is the adoption of an overcooled Exhaust Gas Recirculation (EGR) system which reduces NOx emissions. The system incorporates an integrated exhaust gas by-pass in the EGR cooler which quickly helps to achieve the optimum temperature after start up so that the full cooling capacity can be used. This features a low temperature water circuit for the EGR cooler to reduce still further the temperature of the exhaust gas and lower carbon monoxide and hydro carbon emissions. Equally significant is the treatment of the tailpipe emissions. The system comprises a metallic oxidation catalytic converter offering lower pressure loss compared to a ceramic system and an exothermic catalyst and a catalytic diesel particulate filter (DPF) in the same container. The latter arrangement works in conjunction with a seventh fuel injector which is positioned in the exhaust. This is activated while the particulate filter is being regenerated - a process of which the driver is completely unaware - but significantly means the opportunity for unburnt fuel to pollute the engine oil is removed. It also allows the filter to be regenerated in low-load conditions, such as idling, and therefore achieves a high efficiency level under all driving conditions at the same time as permitting oil change intervals to be optimised. As well as high levels of performance and superb refinement, the V9X engine cuts CO2 emissions in the EX to 224 g/kms and helps the model return a combined fuel figure of 8.4 l/100kms. The equivalent figures for FX are 240 g/kms and 9.0 l/100kms. Reliability and quality targets during development included more than 12,000 hours of durability testing on test benches while transverse and longitudinal V9X development engines were driven more than 1,250,000 kms. In addition every single engine is run on a ‘hot bench test' cycle before it is delivered to the vehicle assembly plant. "When we introduced Infiniti to Europe we knew our first task was to establish the brand as the pre-eminent luxury performance marque with the highest possible levels of service and aftercare. "Now we can move on to the next step in Infiniti's development. The new diesel engine allows us access to a far greater sector of the market without compromising on our core values. More than that, it's an exceptional engine, with impressive torque from very low revs helping to deliver progressive, linear acceleration with none of the typical disadvantages of unwanted noise and vibrations. "By creating a bespoke sporting diesel, we have been able to maintain the combination of performance and luxury expected from an Infiniti with the added bonus of lower emissions and improved fuel economy. It's a win-win position," said Jim Wright.